I came across an ice cream recipe on Crunchy Creamy Sweet that only used 3 ingredients: evaporated milk, sugar and vanilla. I was very curious and excited hoping this would be the low fat ice cream I was looking for! It is a soft serve ice cream. I tried the original recipe but haven't been able to get the amount of sugar to our liking. I found it amazing how 1 tin of evaporated milk chilled whipped up like whipping cream and in only 40 seconds! I wanted to give this ice cream another try and I also had some mangoes that were on the verge of going bad so I decided to adapt the recipe to make mango ice cream. We all really enjoyed it! The mango version isn't soft serve since the water from the mangoes freezes. We actually prefer this ice cream to a post I did back in July. It isn't as sweet and has a nice fresh mango flavour. Since no ice cream machine is used it is a bit time consuming since you have to keep putting it in the freezer and then taking it out to whip up. If you do decide to use your ice cream maker, for mine it was too much ice cream and I would have to do it in 2 steps. Wow, this is awesome, will definitely try it. 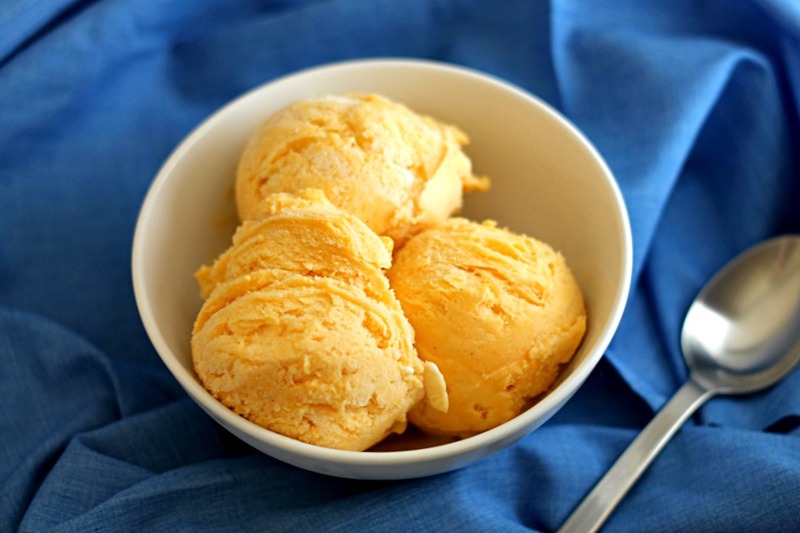 ice cream looks fantastic... simple and delicious.. thanks for sharing the recipe..
Mango Ice-cream, my favorite! This looks so simple & easy to make, yummy! This recipe is so simple and the ice cream looks yummy. I am so glad you tried my ice cream recipe! Mango version sounds fabulous! Thanks for letting me know. Have a great week! This looks fantastic! Found you on the Not Your Ordinary Recipes blog party. I came across your post on Spicie Foodie's YBR, and I'm so glad I did! I love accessible recipes like this that have nothing but flavor and simplicity written all over them. Thank you for sharing, and I'm looking forward to trying it out this weekend if I get the chance to buy some mangoes! Thank you for linking up to Tasty Thursday - your recipe was one of the most clicked and will be featured on Saturday! I just finished a pint of mango sorbet. This looks better. I will pin this for later.